There are men and women who change the paradigms of history. Ivan Van Sertima will be remembered as one of those men. Prof. Van Sertima almost single-handedly introduced and defended the proposition that Africans made significant contact with the people of the Americas, not just before Columbus, but before the birth of Christ. In a larger sense, Van Sertima’s body of work was a powerful challenge to the insane idea that Europeans were the main actors in world history. Prof. Van Sertima is most famous for his book, They Came Before Columbus, published in 1976. At the heart of this magnificent volume is a group of huge stone heads, weighing ten to forty tons, dating to the Olmec culture of Mexico at least 800 years before Christ. The Africanness or Negroidness of the heads is visually undeniable – unless one is a racist, intent on reading Africans out of history. As Van Sertima explained, the evidence goes far beyond fullness of lips and broadness of nose. The heads wore helmets that match Egyptian military helmets of the era. The hair is depicted in stone braided in the Ethiopian style. And most importantly, it is following the period of African contact that the people of that region of America begin building pyramids. Van Sertima also makes the case for a much later African trade and exploration expedition to the Americas, this one from Mali in West Africa in the 14th Century, A.D. Even more than the striking visual evidence of the stone heads, Van Sertima compiles convincing data from a range of sciences and disciplines: mechanical evidence, metallurgical evidence, documents as evidence, African oral histories, and navigational evidence – all pointing to intercontinental contact that impacted on the culture and technologies of Americans and Africans. 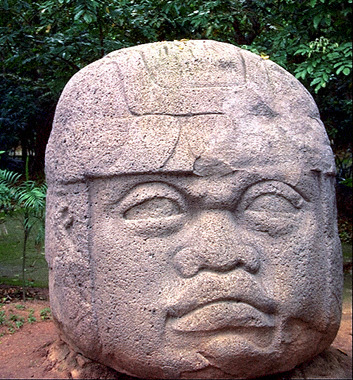 Olmec head from La Venta, Mexico. The discoverer of the heads, José María Melgar Serrano, wrote in 1869: "As a work of art it is, without exaggeration, a magnificent sculpture. But what amazed me most is the Ethiopian [frequently 'Ethiopian' was used to mean 'African' in general – GG] type that it represents. I thought that undoubtedly there had been blacks in this country. And this in the first ages of the world." Most compelling is the fact that ocean currents made contact between Africa and the Caribbean and Gulf Coast region of the western hemisphere absolutely inevitable. At least three currents off the African coast will deposit any boat that ventures into them into American waters. It is a conveyer belt between continents. That is how Christopher Columbus got to the Caribbean, in 1492, and on succeeding voyages – by sailing south to the Canary Islands off the African coast, and then turning into the America-bound currents. And that, said Van Sertima, is how Africans travelled across the ocean, many centuries before. Van Sertima, a native of Guyana, began his 30-year teaching career at New Jersey’s Rutgers University in 1972. By title, he was a professor of African Studies, but his work required a thorough knowledge of literature, linguistics, anthropology, history – all of the disciplines necessary to trace the human footprint on the planet. Van Sertima also worked as a journalist. He understood that his scientific mission was ultimately a political struggle, as well. As he has remarked, Europeans assumed that only white people were capable of moving around the world in a methodical manner. By their logic, if evidence was found of Africans outside of Africa, then someone else must have brought them there. Van Sertima spent much of his adult life debunking such white supremacist assumptions, through sound application of science. Ivan van Sertima, a brilliant scholar and activist historian, died on May 25 of this year. His work was based on a solid historical materialist viewpoint. For example, he never claimed that Africans created Olmec civilization, but showed that they had a strong influence on it. Mainstream historians, not only in the U.S. but unfortunately in Mexico as well, do not recognise the correctness and importance of van Sertima’s work. At the same time, popular pseudo-science still gives credence to the farcical and racist nonsense that aliens from outer space may have created the earliest civilisations in Africa and the Americas. They cannot acknowledge non-white peoples are originators of civilisation.